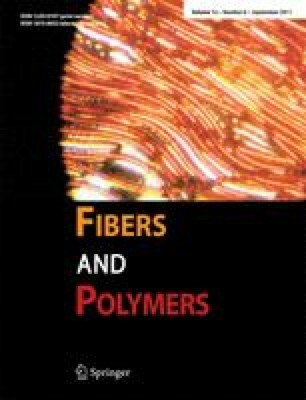 In the present study, conducting nanofillers are incorporated in thermoplastic polyurethane (TPU) to produce nanocomposite fibers through melt compounding route using micro twin screw extruder attached to a fiber drawing device. Nanocomposite fibers using bulk graphite, nanographite and carbon nanofiber were produced using varying amounts of these nanofillers. Metal coated nanographite, new hybrid nanoparticle produced in house, were also used to impart conductivity to the TPU fiber. The process parameters such as processing temperature, mixing time and rpm of the screw have been optimized considering minimum change in TPU bulk properties. It has been found that the nanofillers can be melt mixed safely up to 4 min with the TPU at 180 °C and 100 screw rpm. These mixing conditions give reasonable amount of dispersion. The studies on such fibers in differential scanning calorimetry (DSC) and thermomechanical analyzer (TMA) reveals that the metal coated nanographite particles make the nanocomposite fibers more thermally stable. Both the D. C. conductivity and A. C. impedance of the nanocomposite fibers have reduced significantly even at very low loading of nanofillers, although the conductivity of the produced fibers are in antistatic range (D.C. conductivity ∼10−4 S/m).